Discussion in 'Music Corner' started by Steve Hoffman, Jun 15, 2013.
bump and sticky by request. Dino and bhazen like this. Just gave Waterloo Sunset two spins, it's glorious. Maybe a mistake or maybe not but it sure sounds intoxicating. Now I think I listen to If Only I Could Remember My Name by David Crosby for more fun with phase effects. If your system is up to it, try playing Lou Reed "Walk on the Wild Side".... If it's really up to scratch the part where the chorus girls go... do dee do do do dee do do etc they should sound as if they are walking from somewhere in front of the facing wall, into the room and almost past you. The synths on the end of Steve Hillage " Musik of the Trees" should also seem to race round the room in places if you system is working properly. Goggen, Mike D'Aversa, moops and 1 other person like this. Haven't tried this in awhile -- did so last night for the first time with my current system, and the b-vocs floated about a foot outside the plane of the speakers on either side. I guess I'm in the zone! Wait, that's just the beginning. Move your speakers an inch one way or another, or toed in more or less. Does the "floating outside the plane of the speakers" increase or decrease? Try it different ways. Captain Groovy and bhazen like this. 2 more great "Floating Vocal" tracks by the Kinks are Lazy Old Sun and Picture Book from Village Green Preservation Society. Like I need more reasons to listen to the Kinks! I love this but don't own a copy of the track. Wonder if deezer version will cut it! With The Kinks, a CD I can recommend for this test is the 1991 The Complete Kinks. It is the best sounding Kinks CD I've come across, seems to be a flat transfer mastered very quietly. It needs to be turned up to sound great. Speaking of holgraphic sound, one of the best I've come across is "The Night" (aka Nights in White Satin) W German Moody Blues Days of the Future Passed CD (may also be the case with the vinyl copy). Has anyone noticed the short note about a third of the way through the track which sounds like it is coming from another room on the right hand side? Probably an error in the recording that is doing this but the effect is startling. Just tried this. The backing vocals seem to float quite high above, diagonally up and out around halfway up the TV either side of the speaker plane. 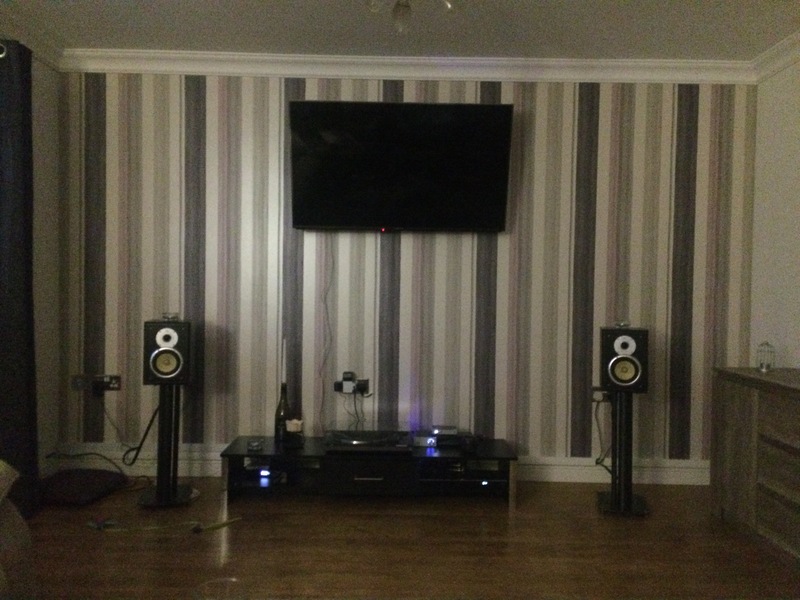 Drums and acoustic guitar around where the wine bottle is mid-point between speaker and bottom of TV (excuse the cat toy on the floor!). Lead vocal about the same on the other side. The effect seemed better with the speakers toed in as they are in the pic (which is how I always have them). Can't say it's coming from behind me really in my listening position as I'm at the back wall. Guess it must be pretty close to optimal given the room and reflective objects (sideboard, curtain, sofa). The big gong in 'Time' on DSOTM also sounds like it's floating around up there on the left too, as another example. And yes, this one, along with the Castle CD version of 'Something Else' I assume are flat transfers as they sound great and can be cranked - with my set up I assume as opimized as possible, the backing vocals appear to whisper in my left ear as if they are singing by my shoulder - really freaked me out the first time I checked it out after reading this thread! I tried this experiment when this was originally posted but could not reproduce the effect. Tried again today. Moved speakers one foot from side wall & back wall. Inched in and out to find the spot where the inside wall of the speaker was just visible (a sliver). Moved my chair back and forward to isolate the sweet spot. Even used measuring tape to identify. No matter how often I adjust speaker angle or chair spot, I cannot reproduce this effect at all. I get really sweet stereo separation and the backing vocals are nice and wide within the stereo spectrum, but no sense of anything around or behind me. Frustrating as Waterloo Sunset is one of my very favorite songs. Is your receiver running in 'home theatre' mode ...? If so, try stereo direct/bypass/2.0 or whatever (if those are options...). I have friends who leave their HT setups in some sort of movie mode, and when they play a stereo music CD it sounds wrong to me. Nope. I don't have a surround setup (or video for that matter) in my listening area. Just standard stereo with no "settings". Presuming your speakers are wired in phase, you should hear the b-vocs at least a bit outside the plane of the speakers. Lovely....It's truly a thing of beauty, listening from the sweet spot.......now, I need to hide the tape-measure before 'she' thinks I'm half-cracked again! JP Christian, Chooke and 68Mustang like this. I'll describe in greater detail what I am hearing. The left/right elements (like the acoustic guitar) are very solidly in their respective speakers. The backing vocals (with the exception of a few that are clearly in one channel) are a "cloud" that encompasses the stereo spectrum but are not anchored in any location. What I am NOT hearing is anything reaching forward from the speakers to get closer to my listening position. Robert C and The Wilderbeest like this. Of course I discovered this phenomena back in the 70s and have been trying to explain or demo it for others ever since. You've made it real easy for others that haven't experienced this to discover it. Once you do discover listening from that precise spot you'll probably never want to listen any other way. This is the vinyl LP release which contains the otherwise unavailable true stereo mix of "Dead End Street." Not at all bad to my ears, though I'm not the purist that some here are... But, that said, it's the only source and it's most definitely a true wide stereo mix. Anybody else here ever notice Rasa's falsetto vocal on "Death of A Clown?" Even works on a crappy YouTube version on my laptop. Moving my head a bit, there it is! Joel1963 and katstep like this. I was doing this last night - (more proper playback) but I was moving the speakers anyway so started to play with "Waterloo Sunset". Floating! Played it tonight on my Audio Note system. Heaven. I have just got to try this when i get home! Shame I can’t do this with my headphones. My speakers are garbage.